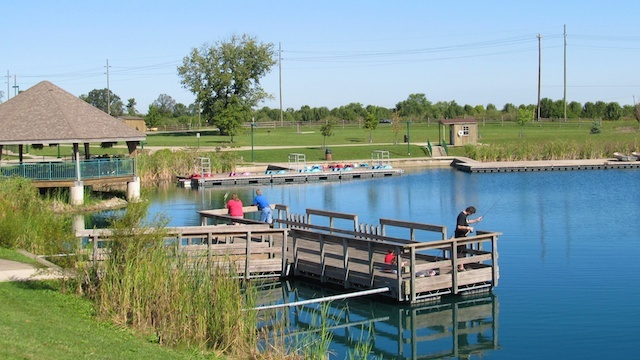 MetroParks of Butler County strives to provide an excellent park system that increases the community’s quality of life through conservation, education and recreation. With its ten parks and numerous recreational activities, there has always been plenty to do at MetroParks. Now, with all of the new developments, there will be even more in store for the future. At Voice of America MetroPark, a popular local hotspot, preparation is still underway for the anticipated opening of the Voice of America Park Athletic Complex in fall 2014. Barkley breaks its development down into three phases. She explains that Phase I development has already occurred with the construction of the 22 multipurpose turf athletic fields at VOA. They were planted in fall 2012 and have been maturing since. Phase II would be the addition of a field house for the fields and sponsorships are being entertained to accomplish this phase. Phase III includes the addition of synthetic turf for the tournament fields. VOA also has an amphitheatre area in the works. It will be used for outdoor performances during the summer. Finally, VOA has its 5th Annual Crazy Cardboard Regatta coming up on July 19. Attendees can race unique boats that they build from cardboard across the lake. It’s free to watch the race and there will be prizes, vendors and food. Barkley goes on to explain that additional changes have sprung from all directions. For example, MetroParks is beginning its second season managing a community garden in the City of Middletown next to the Robert “Sunny” Hill Jr. Community Center. And to the west, during 2013, the Millrace Preserve Area was added to Four Mile Creek MetroPark just outside of Oxford to maintain the land for future generations. Expanding a bit south and slightly west in late 2013, MetroParks obtained an additional parcel of property at 1976 Timberman Road, which is part of the Timberman Ridge Area of Forest Run MetroPark. According to Barkley, this parcel is significant in that it provides safe public access to Timberman Ridge Property and includes a beautiful home that will serve as the Forest Run MetroPark Welcome Center. Master Enhancement Planning Sessions were also held during 2013 to serve park customers for Rentschler Forest MetroPark and Chrisholm MetroPark, incorporating community members’ ideas about what they would like to see happen at the parks. Barkley notes that in addition to all of the rapid developments seen at the parks, there is another special change; the “Friends Of MetroParks” was incorporated as a nonprofit in the State of Ohio in June of 2013. Private citizens in the group came together to support MetroParks last year. They assisted with sponsoring programs and activities that promote the use of all of the parks; assisting in raising funds, securing donations and working with grants; increasing public awareness of MetroParks of Butler County facilities; and identifying and assisting in implementing improvements to all of the parks. They also supported volunteerism in the parks. “This passionate, dedicated group of citizens deserve [a] ‘kudos’ for stepping forward and sacrificing their time to make a lasting impact to support MetroParks’ mission,” says Barkley. Their contributions have helped to push along the new developments and to keep park customers entertained, from camping trips to concerts. Originally written for Cincy Magazine (West Chester – Liberty Chamber Alliance Connections).